office or small workgroup. It delivers the first page to print in just 6.9 seconds, and up to 31 pages per minute. The SP 4100N MICR's simple paper path and smooth paper feeding and handling virtually eliminate paper jams. Front-access trays and a small footprint make it ideal when space is at a premium. The SP 4100N MICR offers Rosetta Technologies Intelligent MICR features like a programmable online dashboard, remote user and administrative control and highly configurable alerts. And, with the ability to emulate PCL and PostScript print streams, the SP 4100N MICR printer surpasses all other printers in its class. EVENT BASED ALERTS. This feature is easily configured to notify users or administrators of 20 different types of events. Each printer status item can be viewed quickly, including empty toner, paper misfeeds, duplex errors, and more. Groups can be created with different types of alerts going to different users. ON-DEMAND ALERTS. This feature is perfect for managers and administrators needing oversight of the entire print network. The on-demand alert feature provides real-time access to reports and usage records. Alerts are fully-configurable for different classes of users. REMOTE UPDATES: In distributed print environments, the remote updates feature allows administrators to quickly and easily identify current firmware versions, and update as needed. DATASTREAM EMULATION: The datastream emulation feature provides for the automatic conversion of control characters in the print stream. This feature is perfect for customers with legacy applications, or those who are transitioning from another brand of MICR printer. Leasing Available from $34.15 per month! Standard Start Up Toner Cartridge for 4100/4110 Series 6k page yield @ 5% coverage. E-13B FONT. This font was created specifically for the SP 4100N MICR printer. The printer specific font ensures the highest achievable readability of MICR characters. CMC7 FONT. This font was designed specifically for use with Rosetta Technologies MICR printers to produce the highest achievable readability of MICR characters. LOW TONER WARNING & AUTO STOP. This feature senses toner level remaining, warns user of a low condition, and stops printing when the toner reaches a level that could adversely impact MICR readability. ORIGINAL-MANUFACTURED MICR TONER CARTRIDGE. Toner formulation and cartridge design specific to the SP 4100N MICR printer engine, ensures high print quality, excellent toner yield, and long fuser life. OPTIMIZED FUSING & TRANSFER VOLTAGE. This feature will automatically manage the fusing temperature and transfer voltage to eliminate high-speed reader/sorter issues with MICR checks. MICR QUALITY GUARANTEE. Rosetta Technologies ensures the readability performance of the SP 4100N MICR printer when used in conjunction with approved MICR toner and check stock. and very small text & numeric print embedded in the amount line of the check. SECURE PAYEE FONT: This unique font appears in alpha and numeric characters on the payee line of a check. It is very difficult to alter because of a special background and very small text. PASSWORD PROTECTION: The SP 4100N MICR offers up to 10 user IDs and passwords that prevents unauthorized users from printing to the printer. PAPER TRAY LOCKS: The optional paper tray lock makes it impossible to access a paper tray containing check stock without a key. DATASTREAM ENCRYPTION: This feature sends secure, encrypted data from the host. The data is then received and decrypted by the printer. This helps to combatcheck fraud because it makes it impossible to intercept the print stream data. The SP 4100N MICR printer is highly configurable so that it can be customized to your specifications. Whether you need WiFi connectivity, a hard disk drive for added storage, locked paper trays for additional security, or an IPDS model, the SP 4100N MICR offers the options to meet your needs. 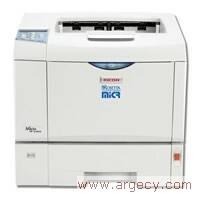 The SP 4100N MICR also has optional duplexcheck printing. This allows everything to be printed in one pass on blank safety stock, pressure seal, or other check paper. This improves hardware utilization, cuts your paper costs, and leads to a quick and sure return on your investment.